N. Vysde bestek, De Landen van Panaraga, Kadoewang. 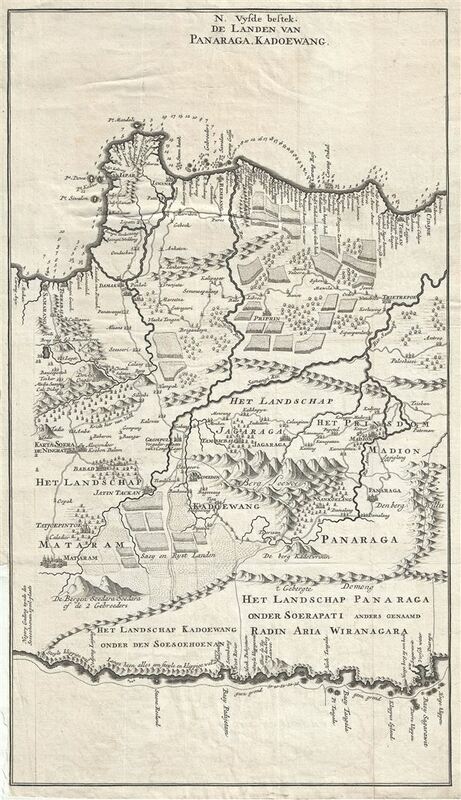 This is a rare and exquisite 1726 map of central Java by Francois Valentijn. It covers from modern day Semarang (Samarang) east to Tuban (Toeban). The important cities of Madiun (Madion), Ponorogo (Panaraga) and others are noted. The map offers beautiful engraving and extraordinary detail throughout, noting rice plantations, mountain ranges, forests, rivers and a host of additional topographical features. The previously unknown southern shore is mapped both correctly and in considerable detail. Offshore reefs, soundings and coastal features are also shown. The Dutch were active in this region since the 17th century and had no doubt produced accurate manuscript charts of the Island, but these were carefully guarded trade secrets controlled by the powerful Vereenigde Oostindische Compagnie (V.O.C. or Dutch East India Company). The VOC's policy of extreme secrecy, especially regarding cartographic matters, historically limited publication of their charts. As a VOC officer, Valentijn doubtless had access to VOC manuscript records which he complied into his remarkable collection of maps. Valentijn's maps are so superior to previous maps that their publication itself is rather surprising, making this particular map an extremely rare find. A highly important map of the region and a must for a serious collection focusing on the East Indies. Prepared by Francois Valentijn for inclusion in his eight volume five part masterwork Oud en Nieuw Oost-Indien. Very good. Minor wear along original fold lines. Narrow bottom left margin. Original platemark visible.